Fully refundable up to 12pm on the day before check-in (24 hours before check-in time). Cancellations must be made via email to reservas@hlefoyer.com. In cases of no-shows and cancellations less than 24 hours before check-in, you will be charged in for the first night’s stay and the rest of the booking will be cancelled. The rates does not include taxes. The rates include breakfast, linen and towels. Breakfast for a group exceeding 40 people, special conditions apply. Read further down for Group Terms and Conditions. If you are booking a dorm, you are booking a bed in a specific room type and not an individual room. We make every effort to place members of your party in the same room, however, this cannot be guaranteed. Please contact us in advance to make requests about specific rooms via reservas@hlefoyer.com. A stay at Le Foyer Hostel cannot exceed 30 nights. After this time, a period of 6 months is required before a new booking with us, exceptions are subject to managerial discretion. Groups consist of 12 people or more. If you have booked a group and haven’t contacted us yet, please send us an email to reservas@hlefoyer.com. Otherwise your booking can’t be confirmed. If you haven’t booked your group directly with us, we cannot guarantee all rooms will be available for your group. Special terms and Conditions apply to groups, please contact us directly. There is no deposit required at the time of the booking for any reservation made through our website, with the exception of a booking with a non-refundable fee. The details of a credit or debit card is taken as guarantee of your booking and should be able to be charged with the cost of the first night. The price of the first night is required when booking directly with our reservation team through email or telephone. Balance has to be paid immediately when checking in at the hostel. We accept cash (PEN and USD only), most credit cards and debit cards with a fee of 5%. When checking in you will be asked to provide us with a credit card number as a caution for any damage that may be caused during your stay. Prior to arrival we can charge on your demand your credit card with the full amount for your reservation. A request has to be sent by email. If you intend to pay for someone’s stay and will not be checking-in to show the payment card, a request has to be sent by email via reservas@hlefoyer.com. If you arrive earlier, you are welcome to leave your luggage in our storage room. Our receptionist will be there with a smile and some tips on where to get a good coffee and breakfast! If it is available, has a fee of 50% of the day rate and is only until 6pm. If it exceeds this time, you will have to pay another night accommodation subject to availability. You can hang out in our lounge area after checking-out if you love the place and want to stay with us a little bit longer ;) under reception discretion. You’ll be given a key when you check-in which gives you access to your room. If you lose your key, you’ll be asked to pay a replacement fee of S/.5, so please keep it safe! A change can be made to your reservation until 12m, the day before your arrival. After that time no changes can be made. If you need to change the dates of your booking, or cancel it, contact our reservation team via reservas@hlefoyer.com or directly on +51 54 286473. Changes of dates are subject to availability and rate differences may apply. If you booked via another website, the changes before arrival will have to be done directly with the agent, please notice that free cancellation lead times vary. A booking can be cancelled without charge if notice is given to Le Foyer Hostel 24 hours prior to arrival day before 12.00 hours (12m local time). Example: If you arrive on a Friday, a cancellation free of charge is possible before Thursday 12m. Please note that the deposit fees paid to Hostelworld, Hostelbookers, Hostelclub and Expedia are not refundable (this money goes directly to these agents). If you fail to arrive for your stay, you will be charged for the first night of your stay and he rest of the nights of your booking will be cancelled. Fully refundable up to 12pm of the previous day before the check-in day. Cancellations must be made via email to reservas@hlefoyer.com. In cases of no-shows and cancellations less than 24 hours before check-in, you will be charged in full for your first night’s stay and the rest of your booking will be cancelled. Cancellation Policies in different websites as Booking.com, Expedia or Hostelworld vary. Welcome to the cheapest place to book your room at Le Foyer Hostel! 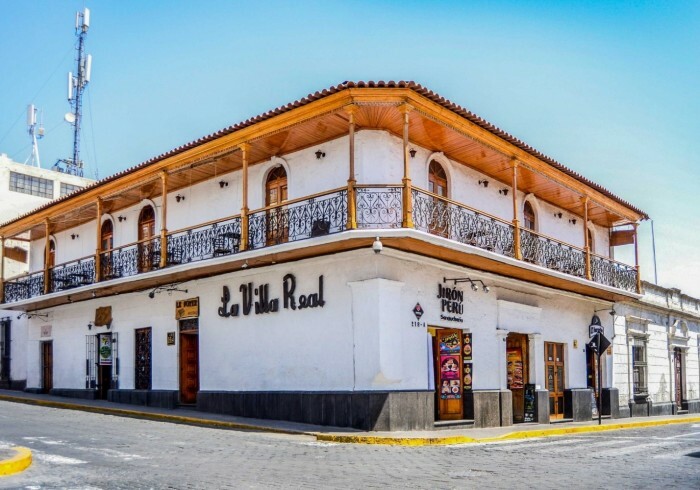 Our hostel is located in a charming colonial house, right in the middle of the historic city centre and only two blocks from the Plaza de Armas. It offers rooms with free Wi-Fi, balcony and breakfast on the roof terrace. Its strategic location provides easy access within walking distance to major attractions, the best restaurants, entertainment centres, banks, shopping areas and pharmacies. Le Foyer Hostel features a lobby with comfortable sofas, cable TV and internet access. Also we offer shuttle service to Rodriguez Ballon airport or bus station, located about 25 minutes from the hostel. Our highlights include an American breakfast served every morning on terrace featuring natural juices, homemade jams and eggs. Guests can also enjoy the impressive sunset views of the city while enjoying some drinks from the bar. And finally, we offer a great location to explore the city, just in the heart of the historic centre of Arequipa.